The Houseboats of kerala are giant country crafts, measuring upto 80 feet in length, retrieved from being lost to the State altogether. Once they ruled the backwaters, poled along by one or two men, heavily loaded with rice, coconut and other commodities. But in the recent times, the kettuvallams have been replaced by more and modern modes of transport, relegating them to neglect and decay. The houseboats of today - huge, slow moving, exotic barge used for leisure trips - are the reworked kettuvallams of olden times. The original kettuvallams were used to carry tonnes of rice and spices - a standard kettuvallam can hold up to 30 tonnes - from Kuttanad to the Kochi port. The kettuvallam or �boat with knots�- was so called because the entire boat was held together with coir knots only - not even a single nail is used during the construction. The boat is made of planks of jack-wood joined together with coir. This is then coated with a caustic black resin made from boiled cashew kernels. With careful maintenance, a kettuvallam can last for generations. A portion of the kettuvallam was covered with bamboo and coir to serve as a restroom and kitchen for the crew. Meals would be cooked on board and supplemented with fresh fish from the backwaters. Today, the tradition is still continued and the food from the local cuisine is served by the Kuttanad localities on board. When the modern trucks replaced this system of transport, some one found a new way that would keep these boats, almost all of which were more than 100 years old, in the market. By constructing special rooms to accommodate travellers, these boats cruised forward from near- extinction to enjoy their present great popularity. Now these are a familiar sight on the backwaters and in Alleppey alone, there are as many as 120 houseboats. While converting kettuvallams into houseboats, care is taken to use only natural products. Bamboo mats, sticks and wood of the aracanut tree are used for roofing, coir mats and wooden planks for the flooring and wood of coconut trees and coir for beds. For lighting though, solar panels are used. Today, the houseboats have all the creature comforts of a good hotel including furnished bedrooms, modern toilets, cozy living rooms, a kitchen and even a balcony for angling. Parts of the curved roof of wood or plaited palm open out to provide shade and allow uninterrupted views. While most boats are poled by local oarsmen, some are powered by a 40 HP engine. Boat-trains are formed by joining two or more houseboats together and are also used by large groups of sight-seers. Have you ever gone houseboat cruising on the backwaters of Kerala? If you haven�t, make sure you do. This one really an absolutely wonderful, unforgettable experience! When the modern trucks replaced this system of transport, some one found a new way that would keep these boats, almost all of which were more than 100 years old in the market. By constructing special rooms to accommodate travellers, these boats cruised forward from near- extinction to enjoy their present great popularity. Now these are a familiar sight on the backwaters and in Alleppey alone, there are as many as 120 houseboats. While converting kettuvallams into houseboats, care is taken to use only natural products. Bamboo mats, sticks and wood of the aracanut tree are used for roofing, coir mats and wooden planks for the flooring and wood of coconut trees and coir for beds. For lighting though, solar panels are used. Today, the houseboats have all the creature comforts of a good hotel including furnished bedrooms, modern toilets, cozy living rooms, a kitchen and even a balcony for angling. Parts of the curved roof of wood or plaited palm open out to provide shade and allow uninterrupted views. While most boats are poled by local oarsmen, some are powered by a 40 HP engine. Boat-trains - formed by joining two or more houseboats together - are also used by large groups of sight-seers. What is truly magical about a houseboat ride is the breathtaking view of the untouched and otherwise inaccessible rural Kerala that it offers - while you float! Now, wouldn�t that be something? � Each houseboat is of excellent construction and luxurious furnishing with exquisite flooring, hull and valavara (canopy). They are in top cruise worthy condition. � Each houseboat with attached toilets, separate toilets for crew. � Spacious passage and a neat, classy kitchen. � Kitchen is properly protected from hazards by fireproofing and fire extinguishers. � Clean environment with a hygienic storage hold, free from insects And safe fuel storage facilities. � Clean good quality linen, blankets, towels etc. � Log books and tourist records are updated regularly and the boat has a valid license. � The service of professional cooks are available on the boat. Kettuvallams, the stitched boats provide the best way to experience the colourful backwaters of Kerala. The Kettuvallams of Kerala are giant country crafts, measuring up to 80 feet in length. The traditional houseboat, the indispensable part of the picturesque backwaters of Kerala, was mainly used in Travancore and Kochi and in the Minicoy Islands in olden times. The wood commonly used to make Kettuvallams is 'Anhili', which is found in abundance in central Travancore area. Large planks are tied together using hand made coir ropes and beaten coconut fibres. This gives the Kettuvallams enough strength to withstand heavy waves in the sea. These long cargo boats are a familiar sight on the backwaters. These traditional houseboats undoubtedly form one of the most abiding images of the backwaters in Kerala. Today, these goods carriers have been adapted to make the most exciting tourism product in India, the luxuriously furnished houseboat. 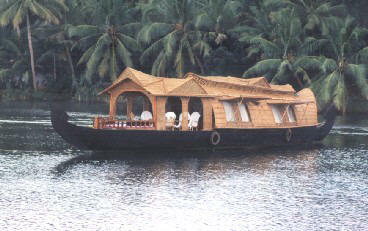 Kettuvallams or the 'house-boats of Kerala' dot the serene palm-fringed backwaters of Kerala. At a quiet spot just outside the small town of Karunagapally, 23 kms north of Quilon, it's possible to watch the construction of traditional Kettuvallams. Kettuvallams are built entirely without the use of nails. It requires great skill and adroitness to construct these giant boats by tying huge planks of jack wood together. The boats are applied with fish oil and cashew nut oil and left to cure for days. Oil is simultaneously applied atleast three times before the boat is set on water. Each jackwood plank is joined to the next with coir rope, and then the whole is coated with a caustic black resin made from boiled cashew kernels. With careful maintenance, they last for generations. A sojourn in Kettuvallams, the House boats of Kerala, offers a panoramic view of one of the most picturesque aspects of the God's Own Country. One can cruise in it through the palm-fringed backwaters, throughout a night in waxing moonlights. The lullaby of the waves and the dazzling delights of the moonlit night can be experienced by spending a couple of nights aboard the Kettuvallam. The traditional houseboat of Kerala is one of the most enduring images of the backwaters. These houseboats are converted version of the "Kuttanadan Kettuvallams". Kettuvallams, the large traditional houseboats are converted into floating luxury dwelling units. These house boats are available in all sizes and shapes, the most popular accommodation type being a suite, having one or two bath attached bedrooms, one living room, kitchenette, an open lounge, deck and a crew comprising oarsmen, a cook and guide. 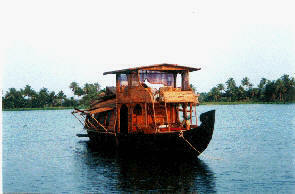 The houseboats are generally powered by a small outboard engine, allowing one to cruise along the backwaters. A recent innovation is a small conference room in a houseboat.